"EAGLE LOCK CO TERRYVILLE, CT. U. S. A. 6 LEVERS". 2 1/16" wide. Cast brass case. Brass shackle. Post key. "EAGLE LOCK CO TERRYVILLE, CT. U. S. A. 6 LEVERS" is stamped on the obverse of the shackle. Mfg by: Eagle Lock Co.
"EAGLE LOCK CO TERRYVILLE, CT. U. S. A. 6 LEVERS". 2 1/8" wide. Stamped brass case. Brass shackle. Flat split key. "EAGLE LOCK CO TERRYVILLE, CT. U. S. A. 6 LEVERS" is stamped on the obverse of the shackle. 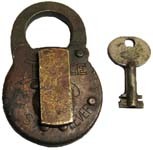 Mfg by: Eagle Lock Co.
"EAGLE SIX LEVER". 2 1/16" high x 1 1/2" wide x 5/16" deep. Stamped steel case. Steel shackle. Post key. Mfg by: Eagle Lock Co.
"THE O. M. EDWARDS CO. 6 LEVERS SYRACUSE N. Y. U.S.A.". 3 1/16" high x 2" wide x 3/8" deep. Stamped steel case. Steel shackle. Flat split key. Mfg by: O. M. Edwards Co. Inc.
"THE O. M. EDWARDS CO. 6 LEVERS SYRACUSE N. Y. U.S.A.". 3 1/8" high x 2" wide x 3/8" deep. Stamped steel case. Steel shackle. Post key. Mfg by: O. M. Edwards Co. Inc.
"ENGINEERS SIX LEVER CORBIN BROS. CO.". 2" wide. Stamped steel case. Steel shackle. Post key. Mfg by: Corbin Brothers Co.
"EXCELSIOR SIX LEVER". 3 1/8" high x 2" wide x 3/8" deep. Stamped steel case. Steel shackle. Post key. Mfg by: Excelsior Lock Co.
"EXCELSIOR SIX LEVER". 3 3/16" high x 2" wide x 3/8" deep. Stamped steel case. Steel shackle. Post key. Mfg by: Excelsior Lock Co.
"FRAIM SIX LEVER" - Brass. 3" high x 2" wide x 7/16" deep. Stamped brass case. Brass shackle. Flat split key. Mfg by: E. T. Fraim Lock Co.
"FRAIM SIX LEVER" - Steel. 3" high x 2" wide x 3/8" deep. Stamped steel case. Steel shackle. Flat split key. Mfg by: E. T. Fraim Lock Co.
"F-S SIX LEVER". 3 1/8" high x 2" wide x 11/16" deep. Stamped steel case. Steel shackle. Post key. Mfg by: Fraim-Slaymaker. "GOLD SEAL". 2" wide. Stamped steel case. Steel shackle. Post key. "H". 3 1/8" high x 2" wide x 7/16" deep. Stamped steel case. Steel shackle. Flat split key. Mfg by: E. T. Fraim Lock Co.
"HAWKEYE SIX LEVERS". 2 1/16" wide. Stamped steel case. Steel shackle. Post key. "INDEPENDENT LOCK CO, LEOMINSTER, MASS. U. S. A.". 3" high x 2" wide x 7/16" deep. Stamped brass case. Brass shackle. Flat split key. 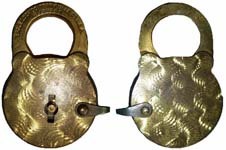 Mfg by: Independent Lock Co.
"INTER-LOCKING S". 3 1/16" high x 2 1/8" wide x 7/16" deep. Stamped steel case. Steel shackle. Post key. "SLAYMAKER" is stamped on the obv erse of the shackle. Mfg by: Slaymaker. "IRONCLAD SIX LEVERS". 3 1/8" high x 2" wide x 7/16" deep. Stamped steel case. Steel shackle. Post key. Mfg by: Corbin Cabinet Lock Co.
"IRONCLAD SIX LEVERS" - Key Logo. 3 1/8" high x 2" wide x 7/16" deep. Stamped steel case. Steel shackle. Flat split key. Mfg by: Corbin Cabinet Lock Co.
"IRONCLAD SIX LEVERS" - Oval Logo. 3 1/8" high x 2" wide x 7/16" deep. Stamped steel case. Steel shackle. Flat split key. Mfg by: Corbin Cabinet Lock Co.
"IRONSIDES SIX LEVER". 3 1/8" high x 2" wide x 7/16" deep. Stamped steel case. Steel shackle. Post key. "IRONSIDES SIX LEVER". 3" high x 2" wide x 3/8" deep. Stamped steel case. Steel shackle. Post key. "IRONSIDES SIX LEVER". 3 1/8" high x 2" wide x 7/16" deep. Stamped steel case. Steel shackle. Flat split key. "IXL WITTE ST. LOUIS SIX LEVERS" - Flat Key - Style 1. 3 1/8" high x 2" wide x 7/16" deep. Stamped steel case. Steel shackle. Flat split key. Made for: Witte Hardware Co.
"IXL WITTE ST. LOUIS SIX LEVERS" - Barrel Key. 3 1/8" high x 2" wide x 7/16" deep. Stamped steel case. Steel shackle. Post key. Made for: Witte Hardware Co.
"J. W. M. Co LANCASTER, PA. SIX LEVERS" - Barrel Key - Brass. 3 1/16" high x 2" wide. Stamped brass case. Brass shackle. Post key. Mfg by: J. Walter Miller Co.
"KING BEE". 2" wide. Stamped steel case. Steel shackle. Post key. Made for: King Hardware Co.
"LEE'S SPECIAL 6 LEVERS". 2" wide. Stamped steel case. Steel shackle. Post key. Made for: Lee Hardware Co.
"LION SIX LEVER". 3 1/8" high x 2 1/16" wide x 7/16" deep. Stamped steel case. Steel shackle. Post key. "L&N". Stamped steel case. Brass shackle. Post key. Made for: Louisville & Nashville Railroad Co.
"LONGWEAR SIX LEVER". 3 3/16" high x 2 1/8" wide x 9/16" deep. Stamped steel case. Steel shackle. Post key. 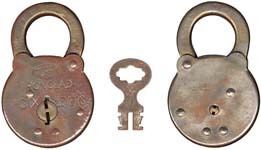 Some locks have "SHAPLEIGH HDW. CO." stamped on the obverse of the shackle. Made for: Shapleigh Hardware Co.